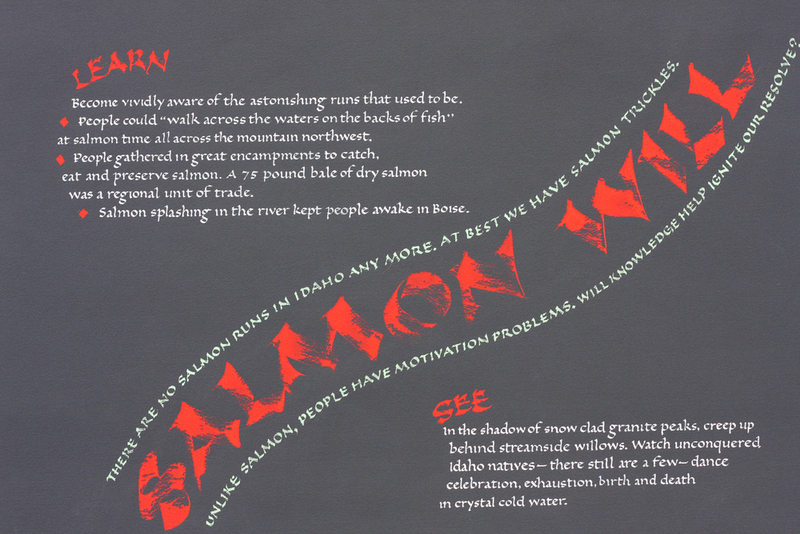 Michael Jones is particularly proud of the 15 salmon-centered calligraphy works he’s created. A Boise vegetable farmer and conservation-oriented activist, Jones was born and raised in Caldwell, Idaho, and reminisces fondly about the days before dams were erected on the lower Snake River, back when he watched salmon course the rivers and streams of the Sawtooth Valley. Calligraphy is an medium Jones first embraced taking a college course in 1967, and he’s worked with it ever since to help bridge art and ecology. 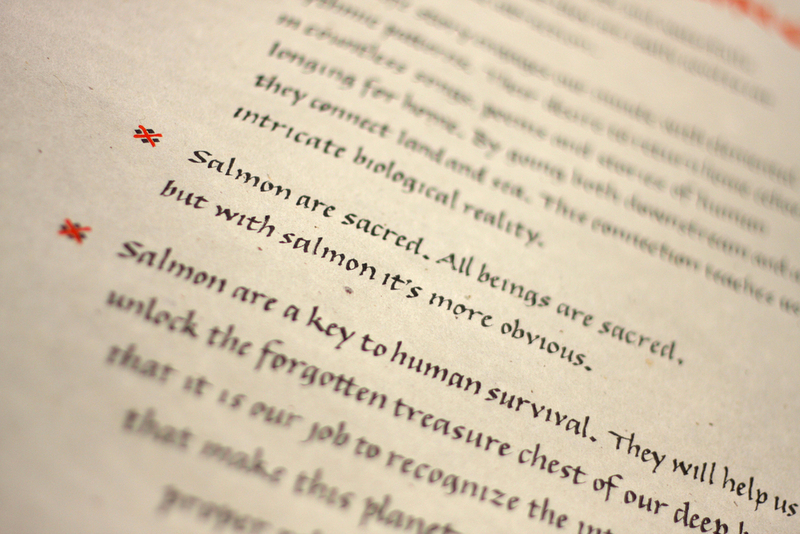 The draw to salmon for Jones is ecological, biological and social, but the species’ metaphorical significance is unavoidably attractive to this natural deep thinker. As one example, his work titled “Salmon Spirit” illustrates his attention to the ethereal interpretations of a species that spans ecosystems. “It’s like the life of a person,” he explained about the metaphors at work in the piece. “As someone searching for some kind of higher truth, one is born, grows up and in maturity reaches — climbs a ladder — to some sort of connection with higher meaning. Jones said the combination of living in Idaho and being away for extended periods help him appreciate his home with vigor. It’s a place with unique natural assets that must be protected by alert citizens, he said, and salmon are at the top the list.